The New York Racing Association, Inc. (NYRA) today announced the 2018 inductee to the Saratoga Walk of Fame: four-time Eclipse Award-winning trainer Bob Baffert, who is one of only two trainers in history to win multiple Triple Crowns. The Saratoga Walk of Fame, which opened in 2015, honors and showcases the achievements of those who have made significant contributions to the sport of thoroughbred racing and the advancement of Saratoga Race Course. The covered structure, featuring the traditional Saratoga turrets, houses commemorative plaques, videos and memorabilia honoring various industry leaders, including owners, trainers and jockeys, who have made an indelible mark on thoroughbred racing. Prior to the opening of the Saratoga Walk of Fame, the tradition of recognizing the greats of the game started in 2013 with the Red Jacket Ceremony, named for the eponymous blazer awarded to the recipients. The plaque for 2018 honoree Baffert will be unveiled during the Red Jacket Ceremony at Saratoga Race Course on Friday, August 24, the eve of the Grade 1, $1.25 million Runhappy Travers. During the ceremony, Baffert will receive an emblematic Saratoga red jacket. 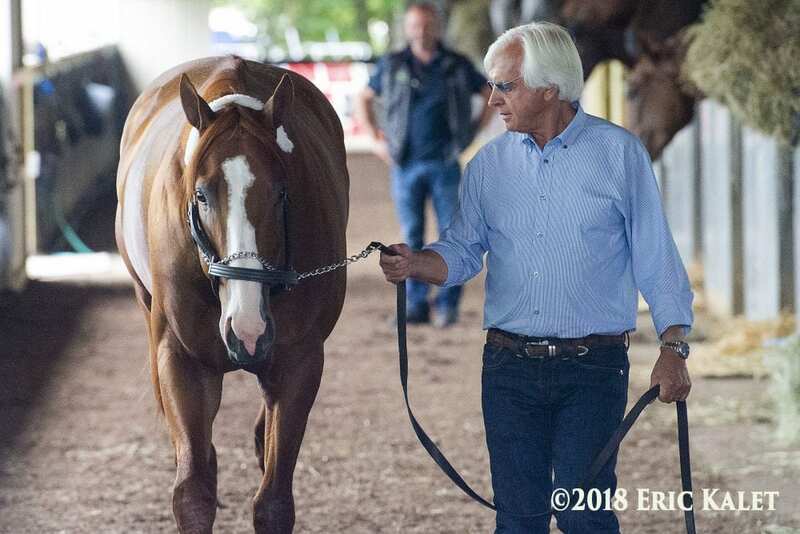 Baffert is one of two trainers in history to capture multiple Triple Crown titles: first with American Pharoah, who ended a 37-year Triple Crown drought in 2015; and, again, in 2018 with Justify. Baffert's 11 Grade 1 victories at Saratoga are highlighted by three Travers victories, including back-to-back triumphs with Arrogate setting a course record in 2016, and West Coast winning the summer's marquee race in 2017. Baffert is a four-time Eclipse Award-winner for Outstanding Trainer, including three straight honors from 1997 to 1999. He has registered 15 victories in Triple Crown races over the course of his career. Baffert was inducted into the National Museum of Racing Hall of Fame in 2009. Guests in attendance will have the opportunity to view the new Triple Crown trophy, which will be prominently displayed during the Red Jacket ceremony. Commissioned by NYRA on behalf of Triple Crown Productions, the trophy was awarded in its inaugural season to Baffert and the connections of Justify following his victory in this year's Belmont Stakes. Made of sterling silver and 14 karat gold, the trophy stands more than three feet tall and features semi-precious stones representing the colors of the three Triple Crown tracks – green, red and green – with a horse and jockey on top. It was created by world-renowned sculptor Roberto Santo. Baffert will join a prestigious group of Red Jacket honorees that includes Hall of Fame trainers H. Allen Jerkens, D. Wayne Lukas, and William “Bill” Mott; Hall of Fame jockeys Jerry Bailey, Angel Cordero, Jr., Ramon Dominguez and John Velazquez; owners W. Cothran “Cot” Campbell, Ogden “Dinny” Mills Phipps, and Marylou Whitney; and longtime New York Racing Association race announcer Tom Durkin. The Red Jacket Ceremony will take place on New York Showcase Day, which features six stakes exclusively for New York-breds, including the $250,000 Albany for 3-year-olds and the $200,000 Funny Cide for budding New York-bred stars. The following day, Saturday, August 25, will feature the 149th running of the Grade 1, $1.25 million Runhappy Travers. Fans who purchase Travers Day grandstand and clubhouse admission in advance will save $5. Advance grandstand admission tickets are $10. A limited number of clubhouse admission tickets are available for $25. Clubhouse upgrades will not be available on Travers Day. Travers Day grandstand and clubhouse admission tickets may be purchased online at www.Ticketmaster.com or in-person at the NYRA Box Office at Saratoga Race Course. All reserved seats, dining and hospitality are sold out for Travers Day. Paid attendance for the 2018 Travers will be capped at 50,000, as has become standard procedure, to provide the best experience possible for guests. Saratoga season pass holders are guaranteed admission on Travers Day. The 2018 summer meet at historic Saratoga Race Course continues through Labor Day, Monday, September 3. For more information about Saratoga Race Course, visit NYRA.com. This entry was posted in People and tagged Bob Baffert, Justify, New York racing, New York Racing Association, nyra, saratoga, saratoga walk of fame, travers, Triple Crown by Press Release. Bookmark the permalink.